We build a race car. 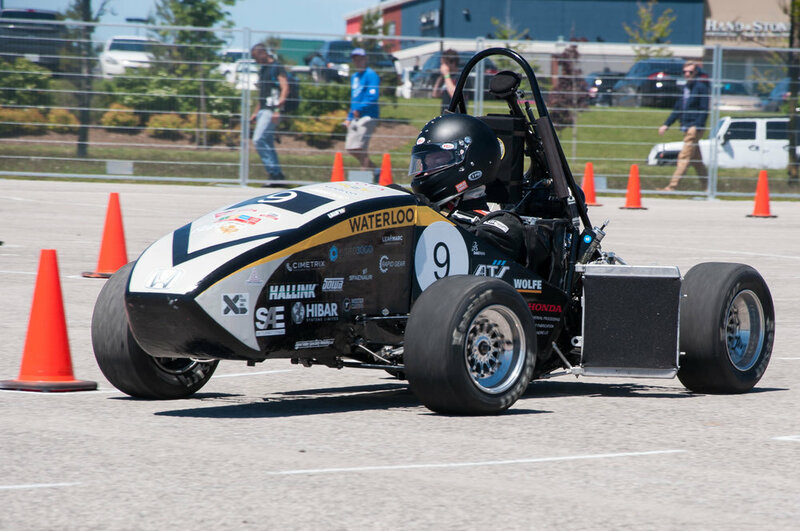 The University of Waterloo Formula Motorsports team (UWFM) designs, builds, tests and competes with an open-wheel formula-style race car. We compete in the Formula SAE Series, across North America and occasionally in Europe. We are all students at the University of Waterloo. Work on the car is completely extra-curricular. While it may not contribute directly to our grades, it is often a direct application of what we study in class, on top of being a source for life experience and skills that classes alone wont teach us. The team (and competition) are built around action. If you want to achieve something, you make the effort to go out and achieve it. We like inculcating a spirit of curiosity and ambition. You don't have to work in professional racing for this to be a useful skill in life. We compete in Formula SAE. New car built every year, annual competitions across North America and occasionally Europe. We have 6 sub teams. Aerodynamics, Business, Chassis, Electronics, Powertrain and Suspension, each specialize in their particular area of the car. 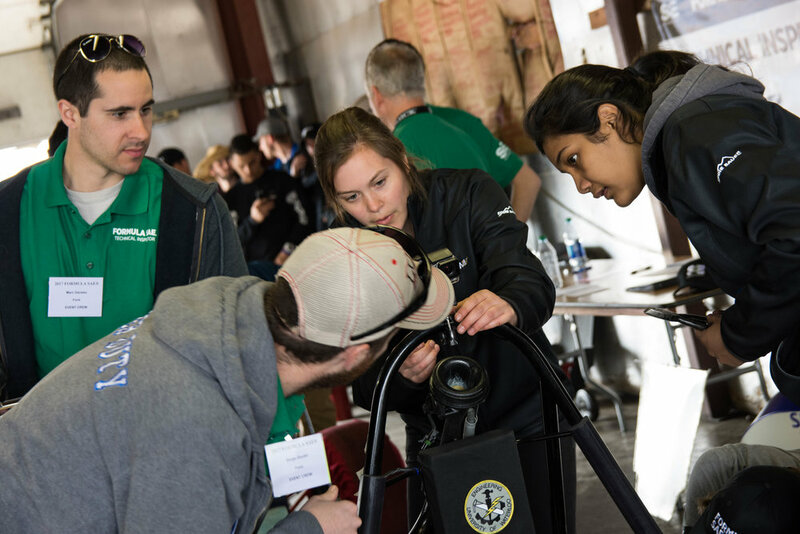 Formula SAE Series competitions challenge teams of university students to conceive, design, fabricate, develop and compete with small, formula style vehicles. Every car must follow the rules laid out by SAE (Society of Automotive Engineers). The intention of the rules is the keep the cars safe and competitive, but leave a very wide range of solutions open to student designers. At competition, about 65% of the points come from dynamic events (Acceleration, Skidpad, Autocross and Endurance), while the remaining points come from static events (Engineering Design, Cost Analysis, Business Presentation and Efficiency). The competition is designed to reward cars that finish all events, but a team cannot be in the top tiers of the competition without a strong static performance - you need more than just a fast car to win. A key thing to remember is that most (if not all) teams raise and manage their own funds to get their car built. Therefore most teams have an established sponsorship program, getting industry professionals and companies to donate cash, infrastructure, services or even their technical expertise to the team - hence the company decals on the car. Wings on the car create down-force, making us faster through turns on track. The aerodynamics team does the fluids analysis for the airflow around the car and over the wings, links the aero effects to vehicle dynamics, builds and tests the wings, and makes the car look awesome. Business handles the team's sponsorship, marketing, finances, recruitment and safety. They are the reason the team continues to exist, and success at competition is unlikely without a strong business team managing the important things. The Chassis is the base structural framework of the car onto which most other systems mount. The two primary design goals for the Chassis Team are the reduction of weight and the optimization of rigidity. Keeping weight low is important to achieve the greatest acceleration and handling for a given engine power. High rigidity is important to maintain precise control over the suspension geometry and keep the wheels firmly in contact with the track surface. Furthermore, that chassis team is also responsible for developing the ergonomics of the cockpit to ensure the driver can comfortably and safely operate the vehicle. Electronics is the brain and nervous system of the car. One of the fundamentals of engineering is validation: taking real world measurements to ensure your design is working as intended. Electronics team makes this happen by managing the car's sensor package: this includes everything from creating PCBs for power distribution, manufacturing the main harness to wire all the parts together, and managing the data acquisition unit and engine control units. Electronics also designs and builds the car's paddle shifting system: this features mechanical design of the mounts, solenoids, and driver interface, as well as electrical design of the PCB and harnessing. The powertrain team is responsible for the engine, and all components and systems that interface with it. We use a Honda CBR600RR motorcycle engine fitted with our own custom designed camshafts to improve volumetric efficiency with the rules mandated 20 mm intake restrictor. While the rest of our engine is stock, the remainder of the system is designed and manufactured by our powertrain team. That includes everything from our Ricardo WAVE tuned intake and exhaust system, to our custom low profile wet sump oil system. The powertrain team is also responsible for delivering the power from the engine to the rear wheels, which is done through a custom Salisbury limited slip differential. Every tenth of a second matters on the track! This is why the suspension team works hard to build and validate vehicle models. Ultimately, the goal is to tune the vehicle for each of our drivers to achieve maximum performance. UWFM's vehicle features an unequal length double wishbone suspension, front & rear antiroll bars, Ohlins dampers, as well as 18x6 inch Hoosier tires. Being the system with the most variables, building a good suspension feels more like solving the world's hardest puzzle.